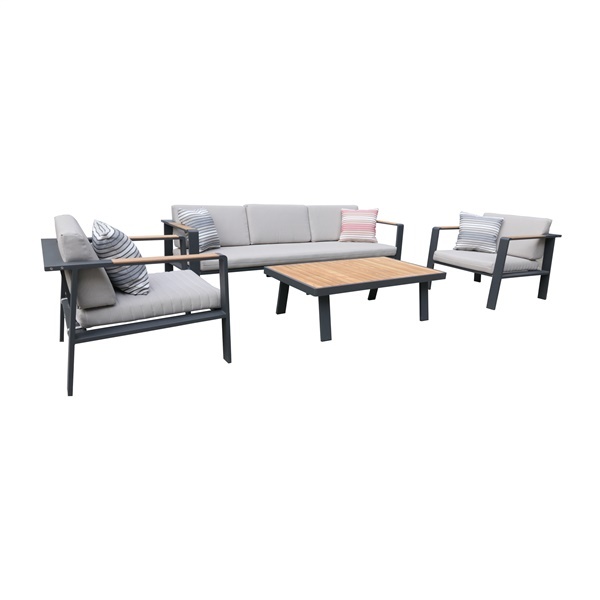 If you are looking for a way that you can make your patio more inviting, this Nofi 4-piece set for your patio is a great choice. It comes with 2 armchairs, one 3-seater sofa and a coffee table. The coffee table has a sturdy metal frame that�s topped off with a beautiful top made of teak wood. The armchairs and sofa are also accented with teak wood to create a cohesive look for your patio. The cushions for the chairs and loveseat are fade, water and chemical resistant, four throw pillows are included for extra support and comfort.